Google Chrome most popular web browser around the world which lets you change the default language. Around the world there are different language speck by the peoples. 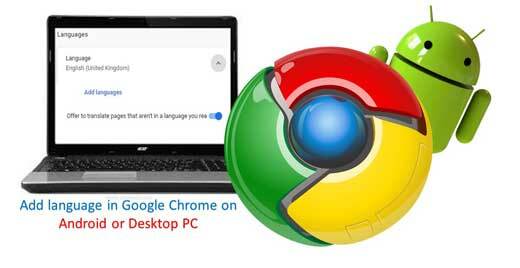 Now, you need to add language in Google Chrome on Android or Desktop PC. By default Google Chrome use English language and allows you to change it. You can easily change the language from all different platforms easily. If you written in different language, then you can easily translate them into your default language. In this guide we have to discuss an easy way to change the language in Google Chrome for Android phone. You can do this job by following given simple steps. Step 1: First you have to open the Settings option on your Android phone. Click on vertical three dots which is located on the top right corner of Android Google Chrome window. Step 2: Scroll down the given options and tap on the Settings. Tap on the Languages option and choose “Add language”. Select any preferred language. Now, you can check this will change the smartphone’s default language. Step 3: Open your Google Chrome window and the language will be the one which you selected. Step 1: Open your Google Chrome at your Desktop PC or Laptop. Step 2: After opening the Google Chrome window, just paste the following link in the address bar. chrome://settings/?search=language and press Enter key. You can also open this page by clicking on the three vertical dots icons which is located on top right corner of Google Chrome window. Click on the Settings option and choose “Language” option. Step 3: Click on the “Add Languages”option. Select any required language as per your need by scrolling the page. You can also directly type the specific language name in the search box. Step 4: Turn on check mark and click on the Add button. Step 5: Now click on the Relaunch button or restart the Chrome and change it to your preferred language. The Google Chrome is already a speedy browser as compare to other browser. But if you make some change in your Chrome browser, then you will easily increase Google Chrome speed for suffering and downloading. To know how to do this job read this guide how to increase Google Chrome speed for suffering and downloading. There are billion of users daily works on the Internet via his Smartphone, PC, Laptop or tablet. Most of the person use different browsing software like Google Chrome, Mozilla Firefox, Opera and many more. Today we discuss few important tips and tricks of Google Chrome. These tricks are very useful to know different things on the internet. If you want to know more about these tricks then please read important tips and tricks of Google Chrome.